Frances writes to the Berry Schools with a $25 donation after reading about the Berry Schools in Southern Highlander. 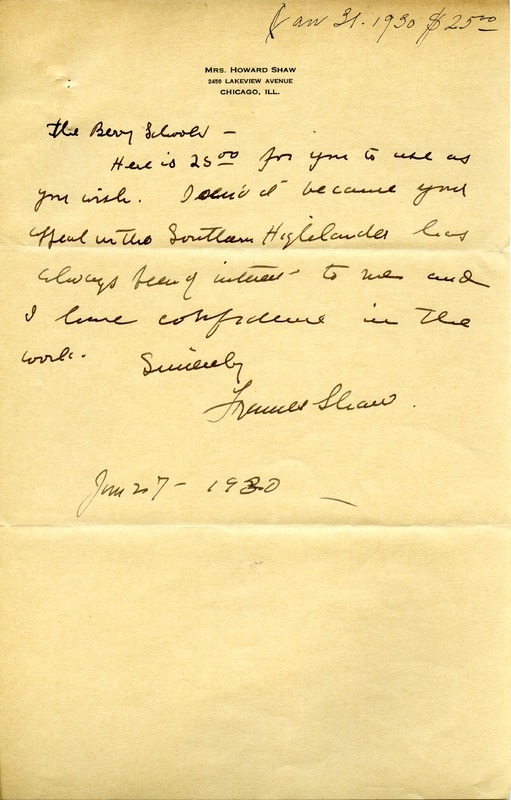 Frances Shaw, “Letter to the Berry Schools from Frances Shaw.” Martha Berry Digital Archive. Eds. Schlitz, Stephanie A., Jordan Brannen, Allison Moore, Aaron Jackson, Meg Ratliff, et al. Mount Berry: Berry College, 2014. accessed April 19, 2019, https://mbda.berry.edu/items/show/13999.